As every gardener knows, the earth has a rhythm. We see it when the leaves stored in tulip bulbs push their tiny, green mouse ears towards the sun. We hear it when woodland frogs raise a raspy chorus on the first warm, rainy night of the season. Spring rushes in with an invisible, irrepressible spirit that awakens the natural world. Spring is in full swing right now at Epcot’s 2010 International Flower and Garden Festival, and I was delighted to travel to Orlando last weekend to experience it. 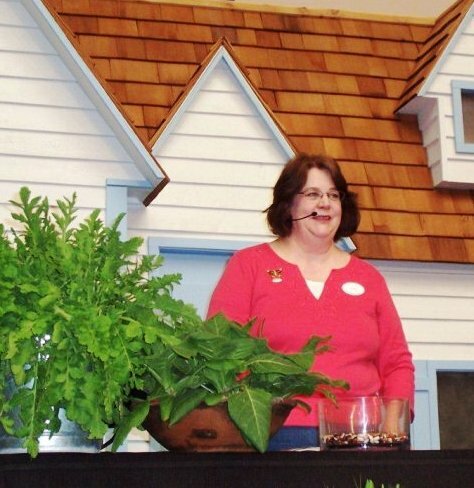 I was invited there to discuss one of my gardening passions—growing heirlooms. Heirlooms are living antiques, or varieties of flowers, fruits, and vegetables that have been passed down from one generation of gardeners to another. They’re the same plants our grandparents grew, and they’re more relevant and fun to grow now than ever before, because heirloom food crops offer more taste and flavor, and heirloom blossoms have more variety and fragrance, than most modern hybrids. The Epcot horticulturists grew out many heirloom plants for festival visitors to see and experience. I recommend trying ‘Moon and Stars’ watermelons, if you’re new to growing heirlooms. Each of these handsome melons has a big yellow spot – that’s the “moon”—and sunny yellow freckles –those are the “stars”—on its blue-green rind. Slice one open and you can enjoy its sugary-sweetness at your next summer picnic. 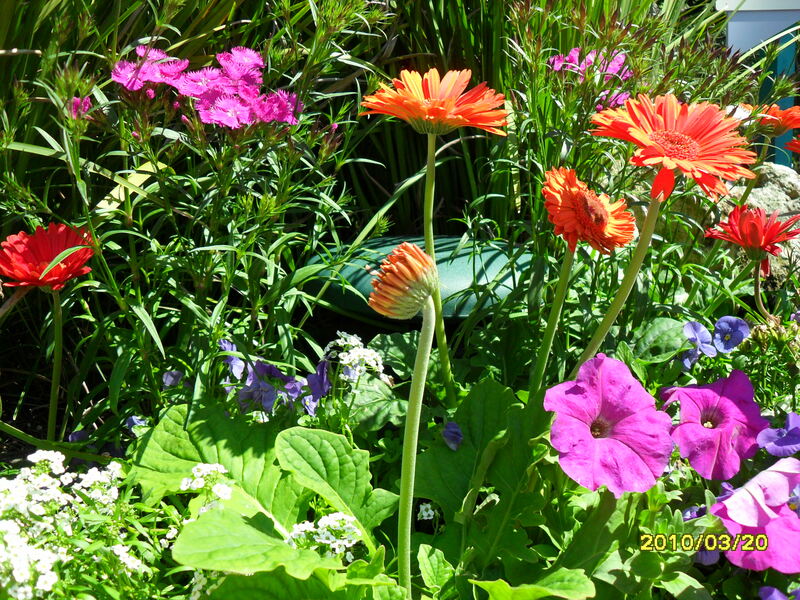 Are you a flower gardener? Sow some “Grandpa Ott’s” morning glory seeds and let the big, heart-shaped leaves shade your porch or deck. There’s a great story behind this morning glory. Diane Whealey, who co-founded the non-profit Seed Savers Exchange in Iowa, helped keep the flowers going after her grandfather, Baptist John Ott, passed away. Grandpa Ott had brought the seeds with him when he immigrated to America from Bavaria, and after his death, Diane named the variety in his honor. Although these gorgeous deep purple flowers could have disappeared, Diane kept them going and introduced them to the commercial seed trade, so today, everyone can grow them. They’re available in the U.S. and back in their Bavarian homeland, and they serve as an excellent example of how a variety can easily become lost, unless caring gardeners step in to preserve its beauty and genetic legacy. If you’re an educator, consider letting the kids in your classroom explore the history of the Far East, Europe, and the Americas, by growing and researching heirloom plants. They’ll discover that tobacco was used medicinally when it was first discovered in Portugal and imported to France, only to be pronounced a serious health hazard centuries later. Students can learn that many of our important foods arrived here on African slave ships, and that the Native American diet once revolved around the spiritual “Three Sisters” crops: squash, corn, and beans. Gardening with Heirloom Seeds includes stories about famous gardeners and plant explorers, too, such as Thomas Jefferson and Western adventurers Lewis and Clark. Heirloom seeds are excellent travelers through time and space. Many have survived without significant human help to evolve into the flowers and foods we enjoy today. Now that spring is here, it’s time to plant, and then, when the growing season winds down, be sure to save some of your heirloom seeds to pass along to someone else. Share. May you always grow a bountiful garden. Lynn Coulter is a journalist and writer whose work has appeared in Delta Sky, Family Circle, Southern Living, and other publications. She lives with her husband and son in Georgia. Lynn is a super gardener and a great author as well! Glad you had her here… thanks! SSE’s founder and director of 33 years, Kent Whealy. They had two motives. One to give Goldman a prestigious role in seed conservation which she does not deserve, and two to allow them to deposit SSE’s rare seeds in Svalbard, something the founder would not have allowed. Svalbard is not the black box storage that it is claimed to be. It is the portal to a FAO Treaty set up to facilitate acssess to seed banks collections for corporate breeders. The current board has viciously attacked Mr. Whealy, has spread malicious lies about him,has denied him access to 33 years worth of papers, has published new editions of his ground breaking books without his name on them, and has attempted to rewrite the history of SSE, giving all credit to his ex-wife who had a marginal role at best, while writing him out of it. Goldman’s actions have appalled SSE’s funders and their funding has vanished. Goldman maintain’s her power at SSE by handing out money to the other board members and lying to everyone concerned. A great injustice hs been done here and you should not be repeating their packaged lies.Diane Ott Whealy facilitated this takeover, driven by her anger at being divorced . We always knew that EAL had talented people, and a few ‘famous’ ones are fun to read about. Congratulations on your success, wish I had some plants handed down through the family.